Über die Zeit. Arbeiten zur Wissenssoziologie II. Publicational or archival source: Frankfurt/M./BRD 1984: Suhrkamp, XLVIII + 198 S.
Norbert Elias Archive (part 1), Inv. Nr. 606-608 (Manuscripts of and notes concerning "An Essay On Time"/"Über die Zeit". 1984, n.d. 3 covers); Norbert Elias Archive (part 1a), no. A36-A37 (Manuscript with title 'A question of time', pp. 1-8, pp. 17-23). in: Macht und Zivilisation. Materialien zu Norbert Elias' Zivilisationstheorie 2, Frankfurt/M./BRD 1984: Suhrkamp, S. 9-82.
see also: Norbert Elias Archive, Part 3 (manuscripts until 1985), sig. "LEBENSLAUF", no. 1 (Sigel "Noti. ", pp. 1-99); no. 2 (Vorfassungen, pp. 2-98); no. 3 ("Zusatz", pp. 1-12). manuscript in: Norbert Elias Archive, Part 3 (manuscripts until 1985), sig. "MISC-D VIII = Krumrey", no. 1 (Vorwort zu Krumrey, pp. 1-8). Krumrey's Buch vorher: Dissertation, Univ. Hannover 1983, unter dem Titel: Entwicklungsstrukturen von Verhaltensstandarden in Deutschland zwischen 1870 und 1970; Norbert Elias fungierte als Zweitbetreuer und -begutachter/ see also: Norbert Elias Archive (part 1), Inv. Nr. 351-357 (Documents concerning graduations for which N. Elias acted as co-supervisor. 7 covers; Nr. 355. Graduation of V. Krumrey. 1982-1983. 1 cover); Norbert Elias Archive, Part 3 (manuscripts until 1985), sig. "MISC-D VIII = Krumrey", no. 3 ("Gutachten", 2 pp.). in: Meike Behrmann & Carmine Abate: Die Germanesi. Geschichte und Leben einer süditalienischen Dorfgemeinschaft und ihrer Emigranten, Frankfurt/M./BRD & New York/N.Y./USA 1984: Campus, S.197-202. vorher: Diplomarbeit, Univ. Bielefeld 1982, von Meike Behrmann, Titel: Wandel der traditionellen Dorfgemeinschaft und Arbeitsmigration in einer süditalienischen Agrargemeinde; Norbert Elias fungierte als Betreuer und Begutachter/ see also: Norbert Elias Archive (part 1), Inv. Nr. 351-357 (Documents concerning graduations for which N. Elias acted as co-supervisor. 7 covers; Nr. 354. Graduation of M. Behrmann, 1981-1983, n.d. 1 cover.). Manuskript in: Norbert Elias Archive, Part 3 (manuscripts until 1985), sig. "MISC-D XIX = Div-KurzMSS", no. 7 (Nachwort zu Behrmann/Abate); sig. "MISC-D XXVII = Behrmann", no. 1 (pp. 1-7). Titel/ title: Vorwort [zu 'Über die Zeit']. Publicational or archival source: in: Über die Zeit. Arbeiten zur Wissenssoziologie II, 1984-B-ger-1, S.VII-XLVIII. Some Remarks on the Problem of Work. in: Aktief, Inaktief. De wederzijdse afhankelijkheid van aktieven en inaktieven in een verzorgingsstaat, Noordwijkerhout/NED 1984: Centrum St. Bavo, S. 5-8.
see also: Norbert Elias Archive (part 1), Inv. Nr. 461 (Documents concerning the symposium "Active and Non-Active People in a Welfare State" at Noordwijkerhout at which N. Elias held a lecture. 1983-1984. 1 cover); Inv. Nr. 609-611 (Texts of and file concerning "Some remarks on the problem of work". 1984. 3 covers); manuscript in: Norbert Elias Archive, Part 3 (manuscripts until 1985), sig. "MISC-E XVII = Welfare", no. 1 ("Whose welfare? ", pp. 1-5); no. 2 ("Welfarestate", pp. 1-6). On the Sociogenesis of Sociology. archival entries: Saskia Visser & Rudolf Knijff. 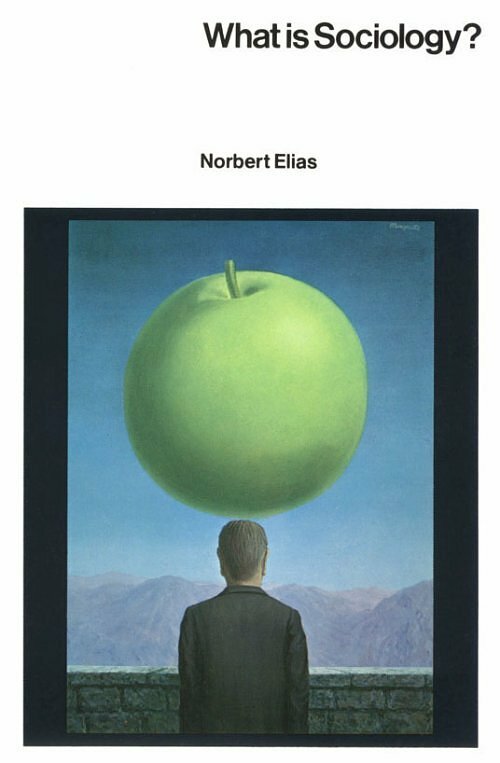 see also: Norbert Elias Archive (part 1), Inv. Nr. 583 (Manuscript of "On the Sociogenesis of Sociology", revised version of manuscript of "The Break With Traditionalism and the Origins of Sociology", p. 1-25, stencil, with handwritten corrections. n.d. 1 cover). note: The "Amsterdams Sociologisch Tijdschrift" was edited as "Sociologisch Tijdschrift" between May 1982 and March 1988. Interview mit Reinhard Blomert und Eberhard Knödler-Bunte. physically archived: personal archives of: Reinhard Blomert; Ingo Mörth. Annotations & explanations: zitiert in/ cited in: Blomert 1999; additional information: eMail from Reinhard Blomert. Titel/ title: Knowledge and Power: an Interview by Peter Ludes. archival entry: Saskia Visser & Rudolf Knijff. in: Society and Knowledge. Contemporary Perspectives on the Sociology of Knowledge, New Brunswick/CAN 1984 & London/UK 1984: Transaction Books, S. 251-291.
see also: Norbert Elias Archive (part 1), Inv. Nr. 1564 (Text of an interview with N. Elias by Peter Ludes on "Knowledge and Power". 1983, n.d. 1 folder); Norbert Elias Archive, Part 3 (manuscripts until 1985), sig. "KNOWPOW", no. 3 (Tonbandmitschrift Interview mit Ludes, 16 pp. ); no. 4 (Reinschrift, korrigiert, 20 pp.). "We hebben nog niet genoeg geleerd de natuur en onszelf te beheersen". Norbert Elias verdedigt het vooruitgangsdenken. in: De Groene Amsterdammer. Onafhankelijk Weekblad sedert 1877 (Amsterdam/NED: De Groene Amsterdammer), 108. Jg. (1984) Nr. 20 (16. Mai 1984), S. 10-11.
see also: Norbert Elias Archive (part 1), Inv. Nr. 1568 (Documents concerning an interview by Aafke Steenhuis for De Groene Amsterdammer. 1984. 4 docs). De geschiedenis van Norbert Elias. in: Vrij Nederland. Onafhankelijk weekblad (Amsterdam/NED: Stichting Vrij Nederland, Weekbladpers Tijdschriften), 54. Jg. (1984) Nr. 48 (1. 12. 1984), S. ? (in: kleurenbijlage/ supplement). Norbert Elias: pas integratie als Turk of Surinamer in de Kamer zit. in: NRC Handelsblad (Rotterdam/NED: Nieuwe Rotterdamse Courant), 15. Jg. (1984), Nr. 22 (27. 1. 1984), S. ? see also: Norbert Elias Archive (part 1), Inv. Nr. 1567 (Letter received by N. Elias concerning a request for an interview by Hubert Smeets for NRC-Handelsblad. 1984. 1 doc). 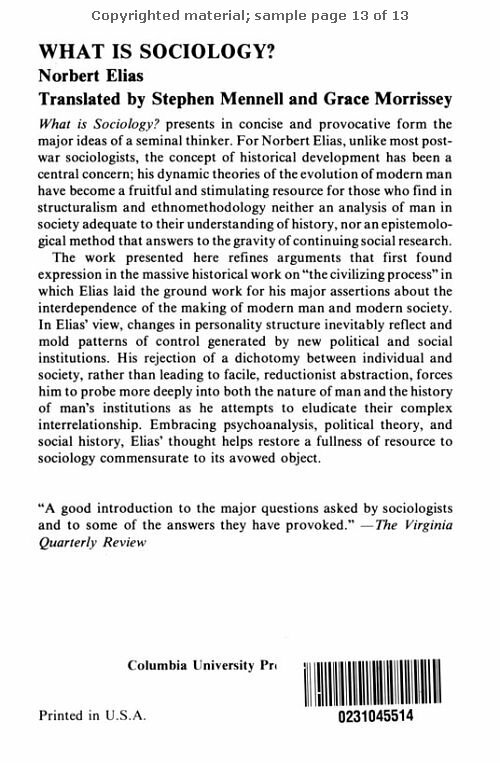 The Changing Balance of Power between the Sexes [this text is a verbatim transcript of a lecture given by Prof. Norbert Elias during a conference "The civilizing process" held at the Centre for Interdisciplinary Research, University of Bielefeld, in September 1984]. Arbeitspapier Nr. 59, Forschungsschwerpunkt Entwicklungssoziologie, Fakultät für Soziologie, Universität Bielefeld, Bielefeld/BRD 1984, 24 Bl. Topics of Discussion: Civilizations and Theories of Civilizing Processes. in: Norbert Elias Archive (part 1), Inv. Nr. 382 (File concerning the conference "Civilizations and Theories of Civilizing Processes. Comparative Perspectives" at the Zentrum für Interdisziplinäre Forschung at Bielefeld with correspondence, prospectuses, a text by N. Elias "Topics of Discussion", transcription of the discussions and a copy of a newspaper clipping. 1983-1984. 1 cover). "I do still have a photocopy of the transcript since I was the one who checked and corrected the transcript by comparing it to the tape recordings of the discussions before I sent it to the Board of the Norbert Elias Foundation in 1987 (or 1988). The draft version of the transcript was written by Miss Gorney (a native speaker of American English) who was asked by, if I am not mistaken, the ZiF to produce it. The tape recordings are also still with me. ..."
Introduction: Processes of Civilization - Empirical Evidences. in: Norbert Elias Archive (part 1), Inv. Nr. 383 (File concerning the conference "Processes of Civilization - Empirical Evidences"  at the Zentrum für Interdisziplinäre Forschung at Bielefeld with correspondence, text by N. Elias of an introduction for the conference ... 1 cover). Titel/ title: Notes to "Sexes". in: Norbert Elias Archive (part 1), Inv. Nr. 630 (Text of "Notes to 'Sexes'" with mark N-Sexes, p. 1-47, carbon copy with handwritten corrections. 1984. 1 cover). siehe auch/ see: Norbert Elias Archive, Part 3 (manuscripts until 1984), sig. "GESCHLECHTER", no. 10 ("Notes to Sexes" Nr. 1-3, 47 pp. ); no. 11 ("Note to Sexes: Three types of Roman marriages", 15 pp. ); see also 1984-G-eng-1. Abschiedsrede/ farewell speech, Zentrum für interdisziplinäre Forschung, Universität Bielefeld/BRD, fall 1984; manuscript in: Norbert Elias Archive, Part 3 (manuscripts until 1985), sig. "MISC-D XIX = Div-KurzMSS", no. 12 (2 pp.). The Formation of States and Changes in Restraint. zit./ cited by Bogner 1989; see also: Norbert Elias Archive (part 1), Inv. Nr. 382 (File concerning the conference "Civilizations and Theories of Civilizing Processes. Comparative Perspectives" ...); Inv. Nr. 708 (Text of transcription of speech "The Formation of States and Changes in Restraint" with corrections by N. Elias. 1986. 1 cover). Statement against racism and racial discrimination. Vortrag bei/ lecture at the conference: Prinsenhofconferentie tegen discriminatie en racisme, Prinsenhof Hotel (? ), Amsterdam/NED, 24. Jan. 1984. De eenzaamheid van stervenden in onze tijd. Essay. Amsterdam/NED 1984: Meulenhoff Editie, 81 S. (serie "Ideën"; no. 763). Il senso della morte nella società contemporanea. in: L'Illustrazione italiana (Milano/ITA: Bramente) 4. Jg. (1984) Nr. 16, S. 6-13. Utopie scientifiche e utopie letterarie per il futuro. weitere Artikel im Heft/ other contributions: Carlo Augusto Viano: La crisi del concetto di "modernita" e la fine dell'eta moderna; Manfred Hardt: Sull'avantguardia leterraria: concetto, storia e teoria; Aurelio Lepre: Il marxismo tra moderno e premoderno. Oslo/NOR 1984: Pax forlag, 94 S.
Titel/ title: Einleitung zu den Briefen (1984). in: Norbert Elias Archive, Part 3 (manuscripts until 1985), sig. "NAZIBRIEFE", no. 4 (pp. 1-3) . = translation of "introductory remarks" of the project "Nazibriefe". See also: Norbert Elias Archive (part 1), Inv. Nr. 579-580 (Manuscript of and translation concerning "An Enquiry into German Civilian Letters". n.d. 2 covers, 1945). Norbert Elias [Interview avec Didier Eribon]. in: Entretiens avec "Le Monde", vol. 3: Idées contemporaines, Paris/FRA 1984: Éditions la Découverte & 'Le Monde', S. 117-126. Nr. 1566. Documents concerning requests for an interview and an interview with N. Elias on "time" by the Österreichischer Rundfunk. 1983-1984, 1986-1988, n.d. 1 cover [interview text probably 1984].